Both companies, and stocks, have experienced hardship in the past two years. Where do these companies stand now and which is the better bet? Las Vegas Sands (NYSE: LVS) and Caesars Entertainment (NASDAQ: CZR) have both struggled over the past two years. Each company's stock price has been hammered since June 2014 and each is going through its own legal battles. However, one company is still outperforming the other and holds more opportunity for future growth. After Caesars went public in 2012, with already around $22 billion in debt, it missed out on global growth prospects such as Macau and Singapore, and instead struggled in a competitive U.S. market. Caesars thus proceeded to post net losses with little hope of recovery from 2012 to 2014 while its debt burden continued to loom. Over the last few years, Caesars has shuffled much of its debt into a subsidiary, called Caesars Entertainment Operating Co. (CEOC) and then in early 2015 attempted to put that unit into bankruptcy along with $18 billion of debt. Caesars bondholders were not so easily dismissed and initiated a lengthy legal battle. Caesars is being sued for $11 billion, which could send the parent company into a full bankruptcy if found liable. Up to this point, Caesars has been unsuccessful in reaching a settlement with bondholders, though the judge in the case recently postponed the trial until August 29 to allow for further negotiations. Las Vegas Sands has aggressively built its business in Macau over the last decade. As of the end of 2015, Las Vegas Sands operates nearly half of all hotel rooms in Macau, about 33% of all slot machines, and about 25% of all casino tables. As a result, when the Chinese government started to put restrictions on visitation and gambling in Macau two years ago, Las Vegas Sands suffered a substantial decline in revenue. Macau total gaming revenues continue to slip each month, with June posting an 8% drop year over year. Still, that is less than analysts expected, less than the 9% drop in May, and far less than the 30-some percent declines from last summer. This suggests that Macau's downturn is bottoming out and some analysts believe it will start to post year over year gains later this year. There are other positive notes in Macau right now, such as slow improvements in the mass market and non-gaming segments which helped to ease the overall revenue loss. If Macau can bottom out and eventually start to grow again, Las Vegas Sands is in a good position to capitalize on that future regrowth. Las Vegas Sands also has it's own legal risks. Earlier this month, it agreed to pay $75 million to the former president of Sands China as well as $9 million in April to settle a related SEC investigation. Sands still faces two other lawsuits with former Macau developers and businessmen that each claim they helped Las Vegas Sands to develop their Macau business but were never paid what was rightfully owed them. These suits could prove at best a distraction and at worst cost billions of dollars. 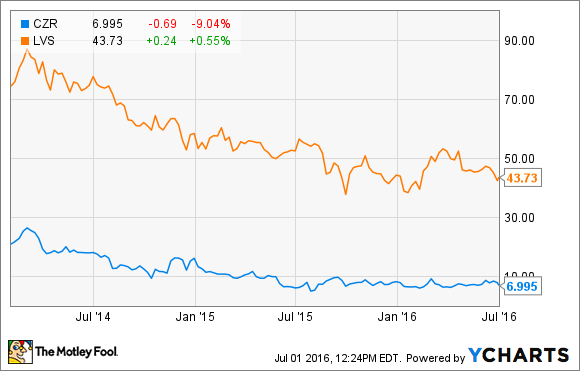 Las Vegas Sands' dividend-is it safe? Shares of Las Vegas Sands yield over 6%, which is another reason to bet on this company over Caesars, which doesn't pay a dividend. Las Vegas Sands increased its dividend payout 30% last year compared to 2014, and it did the same this year, announcing another per-share increase from $0.65 to $0.72. That being said, there is a legitimate risk that Las Vegas Sands will not have the means to continue paying such a high dividend if its Macau operations don't turn around soon. Its dividend and debt expense together take up most of Las Vegas Sands' available cash flow, as explained in this article from my colleague Travis Hoium, leaving little margin for error. Yet, to many investors, some dividend is better than no dividend, as is the case with Caesars. While Caesars and its subsidiaries do have properties outside the U.S., those operations accounted for less 7% of total revenue between all of the segments last year. Caesars has tried in the past to enter markets likes Macau but has been unsuccessful in growing internationally. Las Vegas Sands, on the other hand, is much better diversified globally. It has a presence in Las Vegas and elsewhere in the U.S., and also has more properties than any other company in Macau, has one of the only two resorts allowed in Singapore, and has been one of the most aggressive and could have the best chance of growing in places such as South Korea or Japan that could be lucrative markets in the future. Las Vegas Sands resort in Singapore. Photo: Las Vegas Sands. Even though Las Vegas Sands is also currently in legal battles, its dividend might not be as safe as management says, and its Macau operations are still struggling, it's nevertheless in a better position than Caesars Entertainment is with its pending bankruptcy risks. Both companies are risky bets, but with more resources, more diverse operations, and a focus on global growth, Las Vegas Sands still holds more potential for future gains.